It’s been a busy week for this blogger (10 blogs! Don’t miss Babylon Berlin and Seinfeld), but today - in view of the ever-present Me Too issue - I had to ask this question: Are we allowed to moralise around Barnaby Joyce? The answer is: Yes. And I'm not talking about him leaving his wife & children and getting with his lover. 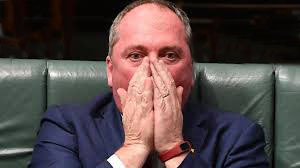 It’s reported that Joyce finally agreed his position was untenable, after an allegation of a sexual assault was levelled at him. What is the allegation? A few years back, at an awards ceremony, a somewhat drunk Joyce pinched a female on the bottom! He strenuously denies the allegation, as does the PM’s office. And this was what finally brought the man undone?! The other possible response, “It didn’t happen, I will strenuously defend myself against the allegation” is just not reasonable. It shows the defender as being morally lacking and, in the case of a politician, lacking judgement and thus being unfit for any job.